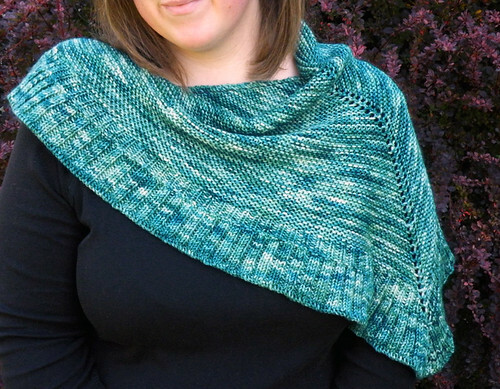 Garter stitch and a little ribbing – nothing special, right? Mara is simple, but classic. Something you can throw over your shoulders on a chilly day, or wear on a night out. Or at least a night out in Idaho. The pattern, which was written by Amy Hendrix, the genius behind MadelineTosh yarn, calls for three skeins of MadTosh worsted. I made mine out of just over two skeins of Wool Candy Fondant, which is a heavy sport/DK weight. The color is Robin’s Egg, and I could go on for days about this yarn. It’s soft, very reasonably priced, and the color is so amazing. I bought two skeins of it at Sock Summit, and when I realized I was going to run out of yarn I contacted the dyer, Adrienne, through her etsy shop about getting another skein. She custom dyed me a skein that matched my other two skeins perfectly, and saved my project. As a testament to how much I love this pattern/yarn, I am still wearing my Mara as I’m typing this. Usually I put my finished project on, arrange it just so, drag my husband outside to take pictures, and carefully fold it up and put it away as soon as we’re finished. I want to wear Mara all afternoon. It’s warm. It’s comfy. And I think it looks terrific. It’s gorgeous!!! I love that color! Yummy color! Beautiful! Beautiful girl too! Gorgeous colours, great work as usual. Absolutely lovely! The colour is gorgeous. It’s lovely. I’m going to add it to my list. PS I’m a retired librarian. Yay, libraries! Lovely! Beautiful colour. Nice pattern. I will try to do. Congratulations. 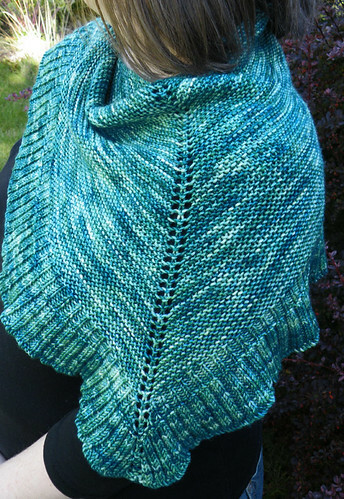 I’m just scrolling through Ravelry posts on this pattern and your mention of “a night out in Idaho” caught my eye. I’m currently visiting my mom in Idaho and perplexed about how to proceed with this pattern. Basically, I just saw the errata corrections and don’t quite understand them. Would you mind looking at my post (last one by klooslip) or email me to clarify the errata instructions? Thanks!